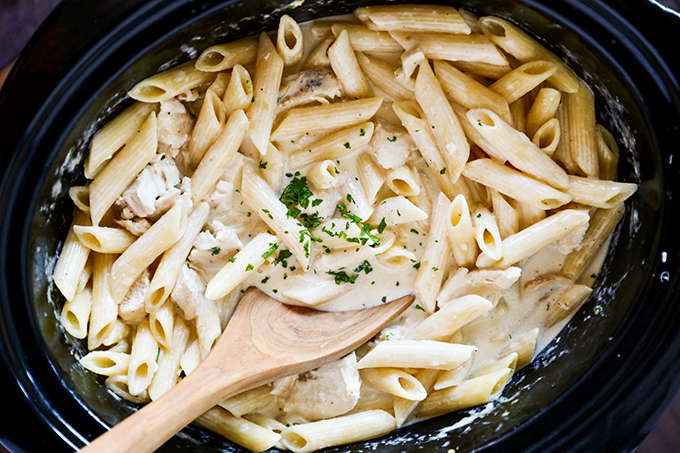 This Slow Cooker Chicken Alfredo is so easy to make. Tender juicy chicken breasts cooked right in a flavorful homemade alfredo sauce and the pasta cooks right in the slow cooker! 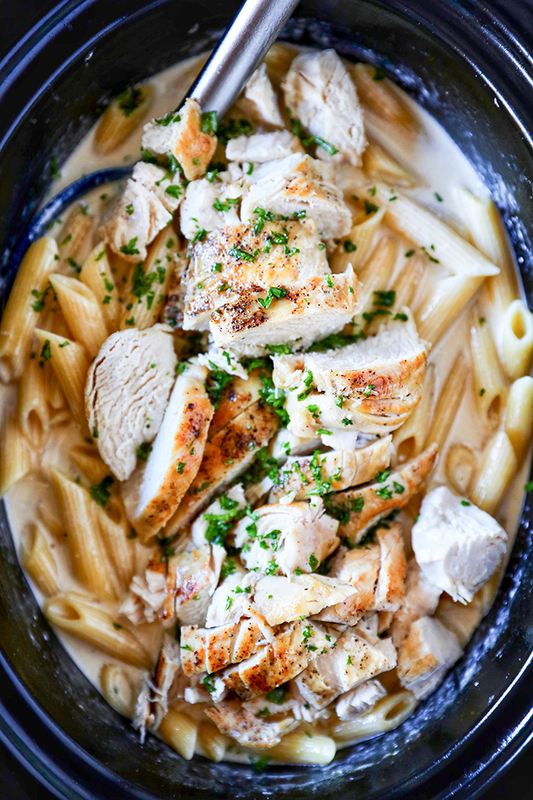 My one-pot chicken alfredo is one of my most popular recipes, and one of our family favorites. I’ve been working on a slow cooker version for a while and I’m so happy with how it turned out. 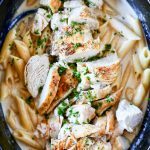 I love this slow cooker chicken alfredo recipe because there is no pre cooking and the pasta cooks in the slow cooker too. It’s rich, filling and perfectly creamy. The best part of this recipe is that the alfredo sauce is completely homemade. Jarred alfredo sauce just cannot compete with the amazing flavor of homemade! Whether you call it a Crock Pot recipe or a slow cooker recipe, this is the perfect way to make an easy family-friendly dinner! Start with a quick sear on the chicken, don’t cook the chicken all the way through. Just add some color to the chicken, this will equate to flavor in the Crockpot Chicken Alfredo. This homemade alfredo is so simple! Once you have put the chicken breasts in the slow cooker, add heavy cream, low sodium chicken broth, whole garlic cloves, butter and salt and pepper. The chicken breasts will simmer all day in the homemade cream sauce and both will add even more flavor to the other. I’ve tried several slow cooker recipes with pasta and have never been satisfied with the texture. It just turns into a mushy mess. 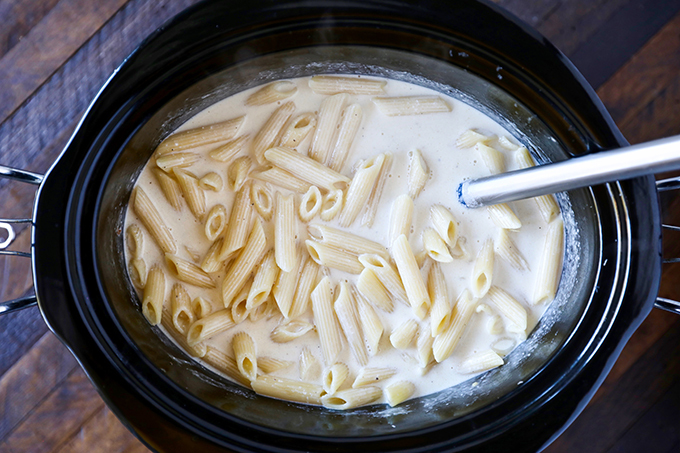 The secret to successful pasta in the slow cooker is to add the pasta at the end. It just doesn’t need to simmer for hours. In this recipe, I add the pasta for the last thirty minutes of cooking and cook it on high along with a cup of hot water. Since slow cooker times can vary so much, you may want to check yours at the twenty minute mark just to make sure it doesn’t over cook. Use freshly grated parmesan cheese for best results. I like to use this microplane to grate my parmesan. Shredded store bought parmesan cheese has additives that keep it from clumping in the bag. This can also keep the parmesan from melting smoothly in alfredo recipes. Pat chicken breasts dry and season with salt, pepper and a sprinkle of garlic powder. Heat olive oil over high heat and quickly sear chicken breasts on both sides. Add chicken breasts, heavy cream, chicken broth, butter, garlic cloves and one teaspoon of kosher salt and several turns of freshly ground black pepper to slow cooker. Cook on low for about 4 hours or high for 2-3 hours, until chicken has reached 165 degrees. 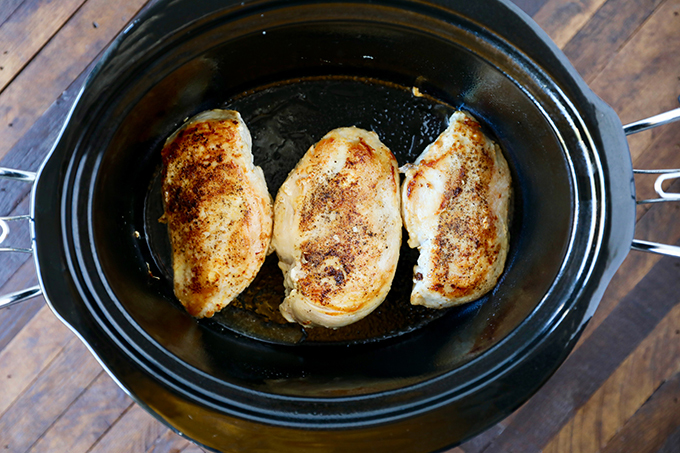 Remove chicken from slow cooker and set aside to cool and slice. Stir in 1 cup of hot water and uncooked penne pasta, cover and cook on high for about 30 minutes. Just until pasta is tender. Once pasta is tender, stir in parmesan cheese, shredded chicken and additional salt and black pepper to taste. This is delicious served with a simple side of steamed or roasted broccoli! Click here for more slow cooker recipes! I made the chicken alfredo for dinner tonight and it was delicious! I seasoned with salt, pepper, italian seasoning, and garlic powder before serving. My fiancé was in awe and thought it came from a restaurant. Thank you for sharing this! Looks delish. Can’t wait to give it a try. Is it possible to cook the pasta separate? It took almost hour for pasta to cook. It taste very good. I just dont know where I messed up because after adding parmasan and chicken , it was all so dry. This turned out great but I doubled recipe to make entire box of pasta (used rigatoni) and added 2 tablespoons of minced garlic to give it a more traditional Alfredo flavor. Also keep some extra Parmesan on hand because I added about another half cup, but my family can never get enough Parmesan so this is a taste preference. I LOVE chicken alfredo, and this recipe was easy and delicious. I seasoned my chicken breasts with Italian seasoning, salt, pepper, and garlic powder before adding them to the crockpot. I also added some minced garlic to the crockpot. FABULOUS! Hello, love the one pot version of this. I’ve cooked it many times. Just a quick question. Would I be able to switch out the penne pasta with fettuccine noodles with the same results? Mine is in the slow cooker now! I am going to add broccoli to it as well. I tried this today. The cream curdled and separated from the chicken stock which looks super disgusting. Is it because I used half and half instead of cream, would that make a difference?? I’m sorry, yes you need to use cream vs half and half. Made this recipe exactly as posted. This is the BEST chicken alfredo recipe I have ever had!!! Even the hubby gave it 2 thumbs up!! This will be my go to recipe from now on! How many calories per serving??? Have this in the slow cooker but with beef stew meat. Can I cut up the raw chicken first, then cook it for the required time? Also, do I have to remove the cooked cut up chicken while the noodles cook or can I leave it in there? Would be a time saver but I’m not sure if chicken would be way overcooked. Can you use fettuccine noodles? Wow. This is the best chicken Alfredo. Added.2 cloves minced garlic and a pinch of Italian seasoning. Sauce is creamy and smooth, not thick and pasty. Grate your own cheese to keep the sauce grit free!! Served with sauteed broccoli and the kids gobbled it up!! Thank you for a wonderful and easy recipe. I just made this (still eating it now!) I expected it to be good, but not THIS good! It’s amazing! This is definitely going to be a regular meal for my family.